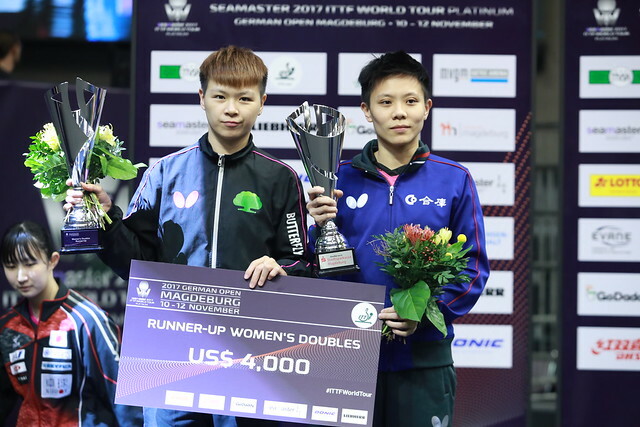 Four trophies are up for grabs on the final day of play at the Seamaster 2017 ITTF World Tour Platinum German Open as the senior competitions draw to a close on Sunday 12th November, but which players will leave Magdeburg with silverware? Here's what's coming your way on day three. The day commences with semi-finals fixtures from the Women’s Singles event, which rather surprisingly features an unseeded player. Feng Yalan began her German Open campaign in the qualification tournament and has since earned superb victories against Miu Hirano, Doo Hoi Kem and Mima Ito on her way to securing her spot in the last four, but can she continue her impressive win streak when she meets second seed Chen Meng in an all-China encounter? Another exciting battle will follow shortly after the conclusion of the first semi-final as China’s Zhu Yuling and Japan’s Kasumi Ishikawa do battle in the top half of the draw. While China has the luxury of having three representatives in the last four of the Women’s Singles competition there is just the one player left competing for the country in the Men’s Singles category with top seed Fan Zhendong flying the flag. Last year at the ITTF World Tour Grand Finals Fan Zhendong found himself trailing Dimitrij Ovtcharov by a 0-2 scoreline before securing four consecutive game wins to defeat the German competitor in the deciding game, will we see another dramatic tie between the two in their semi-finals match in Magdeburg? Timo Boll is the second home player involved in action on the concluding day of the tournament and will have the pleasure of facing Korea Republic’s Lee Sangsu, who heads into the tie off the back of a shock wins against Jun Mizutani and Xu Xin. Could an all-German final be on the cards? Chinese Taipei and Japanese partnerships will fight it out for the Women’s Doubles crown as Chen Szu-Yu and Cheng I-Ching go head-to-head with Hina Hayata and Miu Hirano, while the Men’s Doubles final features the Korean duo of Lee Sangsu and Jeoung Youngsik taking on Japan’s Tomokazu Harimoto and Yuto Kizukuri. Following the conclusion of the two doubles finals will come the Women’s Singles and Men’s Singles title contests.